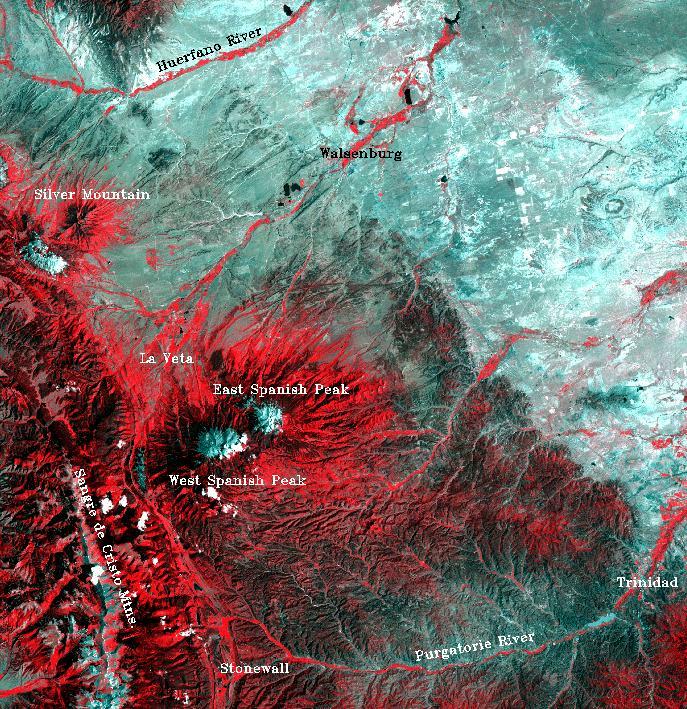 False-color Landsat Thematic Mapper (TM) image of the Spanish Peaks area using bands R:4 G:3 B:2. With this band combination vegetation is bright red. Rivers are highlighted in red due to the vegetation growing along their banks. North is at the top of all images. The stocks of West Spanish Peak and East Spanish Peak are located just left of center. Silver Mountain is another stock found in the upper left center of the image. The southern end of the Wet Mountains is visible at the top of the image. The white areas in the Sangre de Cristo Mountains and on the southwest slope of West Spanish Peak are clouds. This scene was acquired by Landsat 5 on 7/30/92 at about 10:30 am.